Commonwealth Construction recommends concrete or clay tiles for your home or business. To protect what is important to you, Commonwealth Construction metal roofing specialists will design a metal roof that is technologically innovative, durable, beautiful, and lasts a lifetime. 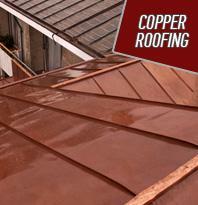 Copper is without question one of thebest of allpremium roofing products. It has been in use for thousands of years. Its continually changing beauty over time has long been a favorite to those lucky enough to live under acopper roof.